Before the shot: The target is mounted in the cryogenic target positioning device. The two copper-colored arms form a shroud around the cold target to protect it until they open five seconds before a shot. The National Nuclear Security Administration (NNSA) and Lawrence Livermore National Laboratory (LLNL) today announced that the National Ignition Facility (NIF) recently completed its first integrated ignition experiment. 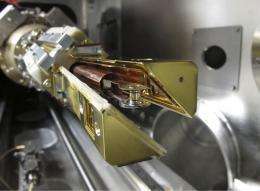 In the test, the 192-beam laser system fired 1 megajoule of laser energy into its first cryogenically layered capsule, raising the drive energy by a factor of thirty over experiments previously conducted at the Omega laser at the University of Rochester. With the completion of this test, NIF is beginning its next phase of the campaign to culminate in fusion ignition tests. NIF is an example of what the NNSA labs do best, said NNSA Deputy Administrator for Defense Programs Don Cook. We are bringing together the best minds in science, engineering and technology to solve some of the nations greatest challenges. NIF, the worlds largest and highest-energy laser system, is expected to be the first laser system to demonstrate reliable fusion ignition  the same force that powers the sun and the stars  in a laboratory environment. When NIFs lasers fire, more than one million joules of ultraviolet energy are focused into a pencil-eraser-sized gold cylinder that contains a peppercorn-sized plastic capsule filled with the hydrogen fuel. After the shot: The remains of the target assembly. NIF was built as a part of the NNSAs program to ensure the safety, security and effectiveness of the nuclear weapons stockpile without underground testing. With NIF, scientists will be able to evaluate key scientific assumptions in current computer models, obtain previously unavailable data on how materials behave at temperatures and pressures like those in the center of a star, and help validate NNSAs supercomputer simulations by comparing code predictions against laboratory observations. Other missions include advancements in fusion energy technology and enabling scientists to better understand the makeup of stars in the universe and planets both within and outside our solar system. How anyone can judge this scientifically `newsworthy' is beyond my comprehension. This fusion facade has been going on for over SIXTY years now ! One PhD thesis after another, & Billions sunk into this purported attempt to create a fusion-energy source for America's electric power grid. What have we got to show for it ? Nothing, except Clinton's `stock-pile stewardship' program, NIF's real purpose,to placate the Russians in lieu of nuke testing. Here is a viable technology for Solving our electric power needs, not a fancy physics experiment. It could completely supply the world's electric power demands for the foreseeable future, were several space-faring nations to band together, & spend the bucks to make it happen. This DOE-BS story about NIF gets every hope-fiend foaming at the mouth, as if its going to start an energy revolution. It is not, & is more biz as ususal. It's going to come down to what wins the contest of feasibility, and it is never either this or that. Fusion also is worth pursuing at all costs because it will resoundingly solve the worlds future energy problem, maybe not for another 50 years, but we plan on existing in 50 years. Solar wind requires a entire complicated industry just to get the equipment into orbit. In a modest land usage, the aneutronic fusion reactor could supply our energy needs for the future in a cleaner and safer way without neutron hazards. Using electrostatic acceleration instead of expensive lasers, I believe it is technologically more efficient and viable to solve world's electric power demand. If you understood the mechanics they're testing you'd recognize this as one of the greatest successes in Fusion since the beginning of LIF testing. They successfully blasted the pellet with a uniform sphere of laser influence. They overcame one of the greatest engineering challenges ever conceived, albeit at incredibly low energy. This was a major engineering breakthrough and shows that LIF is potentially feasible. Up until this test, it was considered to be laughably outside of our engineering ability. Here is a viable technology for Solving our electric power needs, not a fancy physics experiment. That's ridiculous. You don't even have a viable method of transporting the captured energy back to Earth, nevermind the catastrophic size of the resource needs to put a plan like this into action. Fuel alone would be of incredible cost. In the future fusion will be used in a number of different ways- for power generation, propulsion, nuclear 'chemistry', etc. Fusion reactors promise flexibility and independence- they can provide power in the absence of sunlight for instance. Materials such as antimatter will be stored and transported in plasma form. And so research in many directions continues. I can see a laser-powered pulse engine as perhaps the simplest and lightest variant, but I'm only speculating. Humans WILL do these things sooner or later. Building a solar collector is more expensive than you first think. Not as expensive as some would have us think, but the absolute minimum cost of putting something in orbit at say, 460km, would be no less than $300 per pound, even using a hydrogen gas gun to put the components in orbit. Fission rockets have been designed and even tested, and they could probably do the trick, but existing international treaties currently make them illegal. Containment (and ergo "controlled fusion") is not feasible with this system. There's no way to practicably capture more energy than is used to ignite the fuel. It's nothing more than a materials experiment. Okayokay, let me try an explanation... Energy is captured in the form of heat which is converted to electricity which in part powers the lasers for continuing pulses. As in a tokamak- energy is captured in the form of heat which is converted to electricity which in part powers the magnets. In both systems fuel is continuously added because nothing is ever created from nothing except in m theory and your mind. IN FACT, the capture of fusion products is easier with this configuration because there is theoretically nothing in between the source and the capture medium- no magnets, no donut hole, etc. Macht Sinn? Fusion research is only the first step. If this or other fusion machines finally starts to reliably induce fusion, it will be terribly expensive to build the first plants and the efficiency will be poor. Kind of like the first fission plants... uh oh, politics is probably going to kill fusion power before it has a chance to develop into something useful! @rbrtwjohnson: I distrust speculation about fusion processes that do not emit neutron radiation. Just because the "ideal" formula results in neutrons being soaked up, a significant fraction of the reactions will not be so clean. With that much energy you can expect a lot of "off center" hits that fling neutrons in all kinds of crazy directions. this was NOT aneutronic and from what an engineer once told me, the walls and surrounding materials of a fusion reactor would eventually be radioactive waste. however, i argued, it would be a lot less obnoxious than fissile waste. @Sanescience: Aneutronic fusion is where no more than 1% of the total fusion energy released is carried by fast neutrons. On the other hand, conventional deuterium–tritium (DT) release up to 80% of their energy in neutrons. @rbrtwjohnson: I think you misunderstand. I can look up aneutronic fusion on Wikipedia as easily as the next guy to quote what it is. I am stating that no one has ever observed the reactions believed to result in aneutronic fusion, and the descriptions of the conditions necessary for that set of reactions to take place do not inspire confidence that they could be achieved. For example, you fill up a container full of Deuterium and Helium-3. You heat it up to temperatures that fuse the two, which turns out to be above the fusion temperature for D-D reactions, and you end up with neutrons. As far as I know, aneutronic reactions have been systematically studied in particle accelerators, possibly by analyzing energy accounting and byproducts. Furthermore, electrostatic reactors have reported aneutronic reactions. For example, Van de Graaff electrostatic generator can produce more than 20MV, hence, having a correct charge/mass ratio the aneutronic fuel can be accelerated to more than 550keV (ITER and NIF can barely reach 15keV). Now, having a fusion reactor with a "cusped penning trap configuration", preventing premature ion recombination with the chamber, postponing recombination to the output, it will be a very high voltage acceleration system with low current consumption. 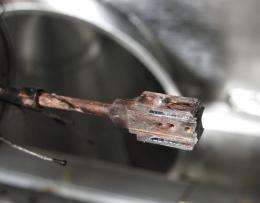 It can be even more energy-efficient if using superconducting magnets. I believe electrostatic acceleration is the simplest and efficient way of harnessing the aneutronic fusion power. I'm a bit disappointed that this experiment didn't result in the cool special effects in Spiderman 2. Can someone please explain why they needed to use gold in the experiment? At around $1,400 per ounce, did they really have to vaporize it?